We sell both NEW and USED and this used Demo showroom unit is just like NEW never fired up. Valid WARRANTY with unit. Call or contact us to inquire at 319-298-0500. We also sell brand NEW inside a carton strapped to a skid. Highlight features are: it will burn corn, wood pellets, a mixture of both, wheat, sunflower seeds, and bio-mass; cast iron historic design flair, self lighting and fully automatic, thermostatic control, herringbone brick interior, aluminum heat exchanger, jam-proof feed system, easy firepot cleaning and ash dump, limited lifetime warranty, either pedestal or leg models, pedestal model mobile home approved. EPA CERTIFIED PHASE II APPROVED. At a low particle emission rate of 0.80 grams/hr this unit meets or exceeds the EPA Certified Phase II Emissions Standards at 7.5 grams/hr for non-catalytic wood stoves and 4.1 grams/hr for catalytic wood stoves. Wood pellet stoves ar non-catalytic. It also meets or exceeds the strict CALIFORNIA Standards, COLORADO Phase III Approved, state of WASHINGTON Standards (less than 4.5 g/hr. ), and the strict OREGON Standards (less than 2.5 g/hr) for particle emissions. 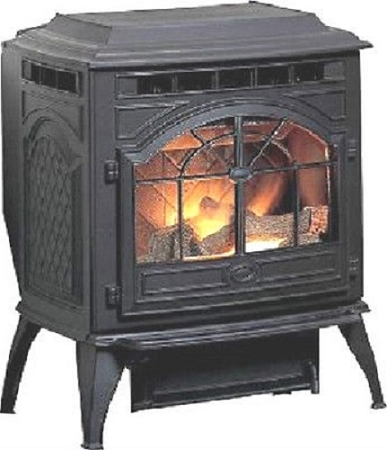 STOVE CAST IRON, Vermont Victorian, WOOD PELLET, 40,000 BTU/Hr, Heats up to 2000 Sq.Ft. FIREPLACE INSERT: Bay Window CORN/PELLET, 50,000 BTU/Hr., Mult-fuel Capability, 2500 Sq.Ft. FURNACE CORN/PELLET, Forced-Air Ductor, up to 100,000 BTU/Hr, Multi-fuel, Heats 3,500 Sq.Ft. COMBO BOILER FURNACE, 70,000 BTU/Hr, Corn, Wood Pellets, Multi-fuel, Heats up to 3000 Sq.Ft. First-time buyers (users) of corn stoves can feel comfortable about their purchase and installation because included is an installation DVD Video. It is included in a sealed envelop inside the carton to be shipped. Fresh air sources may be either room air or fresh air kit. A fresh air kit is especially recommended for newer contructed homes that have air-tight construction...as room air vacuum may be crated without it. Also inside air has impurities and is human-breathed, carbon dioxide saturated. Experience in the operation of Corn Stoves we recommend you: (1)Try to find local corn sources (farmers) with 12 to 14% moisture content from those who cater to corn stove owners; (2) Use crushed oyster shell with your corn and scatter or layer it into the hopper like layering soap in the laundry machine; (3) Learn how to run your corn stove with the least amount of air possible as too much air makes the stove run faster with waste, ash, and over heating; (4)High moisture content of corn 15% can be offset by burning crushed oyster shell and partial wood pellets; and (5) Everyone should experiment burning either a corn/wood pellets mixture or wheat. If corn prices soar, then you can switch to 100% wood pellets or wheat. You will have experience burnning it. The autolite feature works better with a wood pellet/corn mixture; (6) Everyone should consider sprinkling crushed oyster shell into their corn to facilitate a cleaner burning and less ash. For customers with forced-air ducting furnaces, we have some simple recommendations on how you can revise your existing duckwork to improve the performance of this free standing Stove. However, if you want to spend more money, then we have another furnace specifically designed for forced air called The Forced Air Ductor. It can be hooked up to your existing ductwork. It is multi-fuel and will burn corn, wood pellets, etc. It is listed as Forced-Air Corn Wood Pellet Multi-fuel Furnace and we have one that just arrived and it is found in our Ebay Stove. . It is more expensive, spend more and get more. Grab it as it just arrived! Contact us by phone or E-mail for additional comments. Included is our 50 page OWNER'S MANUAL with an installation VIDEO (DVD) with pictures that gives a wealth of information. We are the only ones that include a Video with the corn stove purchase. In the Owner's Manual is a step by step instruction for installation for Exhaust Flue Vent Kit (not provided) and startup. Exhaust Flue Vent Kit can be purchased separately at your request and/or check our Ebay Store. You should also consider installing a Fresh Air Intake Kit (see Ebay Store) and you should install it to not only avoid room air vacuum, but also control the amount of air fed into your stove. Heating capacity up to 1500 sq. ft., BTU output up to 35,000 BTU/Hr., Hopper capacity 40 lb, Fuel wood pellets or corn, EPA Particle Emission Rates were tested at 0.8 grams/hour. Weight 350 lbs, 24" wide X 29" high X 25" deep. Electrical 110 VAC, 3 Amps, 60 Cycles, Power Outage Module 1000 Watts option available, Safety Tested and Listed to ASTM-E 1509, ULC/ORD- C 1482, (UM) 84-HUD, and EPA Approved. Manufacturer: American Home Hearth Company. On Nov-07-05 at 07:51:15 PST, seller added the following information: Always buy from a DEALER. Never buy from individuals.